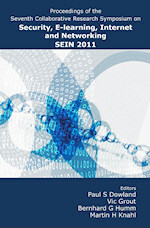 This book presents the Proceedings of the Seventh Collaborative Research Symposium on Security, E-learning, Internet and Networking, hosted by Furtwangen University of Applied Sciences, Germany, on the 27-29th October 2011. All authors are researchers from Plymouth University; University of Applied Sciences Darmstadt; Glynd&#373;r University and Furtwangen University of Applied Sciences. They are all PhD students or postdoctoral researchers working in the presented areas. We hope this book can show new and interesting ideas for a wide audience especially for those who could not attend the Symposium.